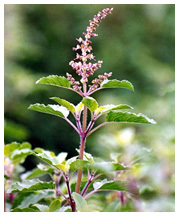 Well-appreciated for its remedial qualities, the holy herb, Tulsi, has been popular for centuries. It is also a pillar of traditional Ayurvedic holistic healing system. Honey and Tulsi have been used since times immemorial for treatment of common cold. Recent researches now reveal that Tulsi contains aromatic oils that cure cold. The tannins, present in the herb help reduce throat inflammation. Apart from using it for colds, the extracts of Tulsi are being used in Ayurvedic remedies for curing stomach disorders, headaches, heart diseases, inflammation, malaria and some forms of poisoning. Tulsi also contains Vitamin K, which plays an important role in blood-clotting. Two teaspoons of Tulsi is said to meet about ten percent of daily iron requirements. Tulsi can be consumed in any form such as dried powder, fresh leaf, herbal tea, or mixed with ghee. The essential oil taken from Karpoora Tulsi is used for medicinal purposes in herbal toiletry too. Tulsi is even mixed with stored grains to repel insects. Tea brewed with leaves of the holy herb, relieves stress as well. Tulsi, on the whole, is considered an elixir of life.